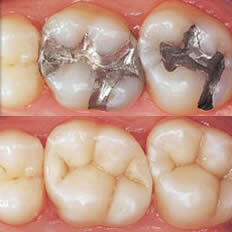 Decayed teeth should be cleaned from caries. After the removal of caries a filling is used to replace the tooth structure lost by the decay. There are three main types of filling materials; amalgam filling (silver), composite filling (white), and glass-ionomer filling (fluoride releasing). Ask your dentist which is the best filling material suitable for your case and whether it is possible to change your silver fillings to tooth colored white fillings or not.